Thanks to processed and fast foods, being overworked, and feeling stressed while eating on the fly, it is increasingly difficult for most of us to eat anywhere near a balanced diet. We may not be obviously sick, but may suffer from lack of focus, insomnia, sluggishness, or any host of symptoms caused by nutritional deficiency. 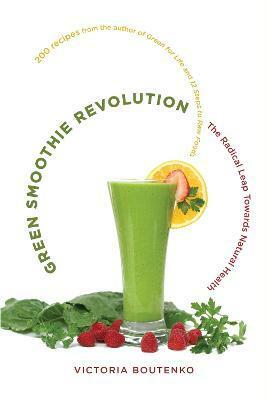 Green Smoothie Revolution takes aim at this silent epidemic by restoring balance to our diets. Combining nutrition and know-how with recipes that pack a powerhouse punch, Victoria Boutenko reintroduces long neglected fruits, vegetables, and greens in the most persuasive style for our busy lives: with fast prep and delicious results. Featuring 200 recipes, Green Smoothie Revolution offers both simplicity (4 ripe pears, 1 bunch parsley, 2 cups water; blend well) and enough variety to keep taste buds happy and nutrients coming from a wealth of options. "In more than thirty-five years of practice as a psychiatrist affiliated with the Harvard Medical School, I have learned one thing very well: Human behavior is very hard to change. Now Victoria Boutenko is persuading me otherwise.... Thirty days of green smoothies will change how you feel, and how you feel about yourself. That's no small achievement for one small book." --A. William Menzin, MD, Harvard Medical School "Green Smoothie Revolution: The Radical Leap Toward Natural Health is one among many naturopathic books available that attempt to get people eating healthily again... Filled with easy, quick recipes that combine familiar and unusual fruits, vegetables and greens, Victoria Boutenko serves up an excellent book to readers who will all be hungry for more." --Examiner.com "This book is groundbreaking and needed by a population whose health is threatened by its own processed food supply. From a naturopathic perspective, the most important constituents of healing are here in these new recipes--enzymes, amino acids, fiber, minerals, antioxidants, and much more. Victoria Boutenko has an intense sense of curiosity combined with a brilliant mind... Join the Green Smoothie Revolution! You may not buy a more important book this year!" --Ariel Policano, ND "It is clear that Victoria Boutenko did her homework, because I found myself highlighting sentences on nearly every page. Though Victoria includes ample science in her book, the tone is very conversational and easy to read...This book has truly inspired me to get back on track with more green smoothies." --Basil & Spice "I rarely say this, but I am a big fan of this book. I would recommend reading Green for Life and then picking up a copy of Green Smoothie Revolution to launch your new understanding of health and nutrition to the next level." --Ridgefield Wellness "Boutenko's book is a simple guide for anyone who wants to find out what all the green smoothie fuss is about. Readers will learn why green smoothies are so healthy, why we should have more greens in the first place, and what health changes one might expect from this lifestyle change... I know right where to go for added health inspiration." --dkMommySpot.com "Public health could be completely revolutionized by following Victoria's advice... Green smoothies are for everyone, not expensive, and [Victoria Boutenko] even tells you which greens you can find through foraging... Highly recommended." --Eco Mama's Guide to Living Green "[Green Smoothie Revolution] provides lots of info and inspiration -- basically anything you could ever want to know about green, blended drinks." --The Nutritionista "In Green Smoothie Revolution, Victoria has truly created a companion guide to Green For Life... Together, both of these books create all you need to know about Green Smoothies. There are a vast amount of recipes included in this book, with bonus recipes for pets!" --Raw Food Right Now "You may not think that reading about how humans and chimps share 99.4% of the same genes is exciting, but it is! Boutenko has unlocked the missing component in human nutrition...Her passion for healing is clear." --The Raw Mocha Angel "Green Smoothie Revolution is an educational and inspiring reference book, giving us an understanding of the power and miracle of greens... Everyone should have a copy of this book." --Raw Epicurean "What a great resource for overall health and nutrition!" --Naptime Reviews "The great part about [Green Smoothie Revolution] is the variety of recipes...that are all fun and different...Overall this is a great book for those interested in raw foods, green smoothies and healthy new ways to get greens into ones diet." "One really important concept that I learned from Green Smoothie Revolution was...even if one does not adopt a 'raw foods diet, ' but supplements a regular diet with one or two green smoothies a day, there are still immense health benefits." --Lily of the Valley "[Green Smoothie Revolution has] lots of great information and ideas for smoothies... I love the idea of getting my favorite dark, leafy green vegetables into such an easy snack or light breakfast...They keep me full longer than fruit alone and are perfect before an early morning workout." --Find Your Balance Health "[Green Smoothie Revolution] is a nice primer on a very easy way to amp up your nutritional habits... Raw foods can be intimidating but this is such an easy first step." --Best-SellingBooks.com "I love this book... I usually throw a little bit of everything into the smoothies I make (veggies, fruit, nuts, seeds, etc. ), but this book gave me some inspiration for a slightly different approach. Boutenko stresses the importance of dark leafy greens, and gives lots of recipes for incorporating these healthy plants into smoothies." "There are some amazingly good points in the book, and I absolutely support the daily consumption of green smoothies... If you want great smoothie recipes, I totally recommend this book." --Julie Loves Dogs "[Green Smoothie Revolution] is a great book...I highly recommend it... [the book contains] loads of recipes and tips, and also provides a detailed understanding of why you should go raw, and the wonderful healing power of green smoothies." "[Green Smoothie Revolution] will not only help you become personally greener, but it will spark your creativity gene and give you the green light to experiment." --GoRawMe "The book is crammed with recipes, but the basic idea is easy to run with." --Star News "I highly recommend [Green Smoothie Revolution]... reading this book has convinced me that green smoothies can truly deliver. Already, I have tried a few of the recipes in the book, I can definitely feel the nutritional boost in energy from this amazing beverage!" --Carlos Rull, Raw2Zen "I had some questions and thoughts about the smoothies that I planned on figuring out by doing some e-search, but this book gave me all the info I was looking for! I finished it in under a day." --Sabine, The Fruit Persuit "Green Smoothie Revolution provides comprehensive information with a large selection of recipes from the creator of green smoothies, Victoria Boutenko. It will appeal to dieters who are ready to make a dramatic lifestyle change as well as those wishing to improve the nutritional quality of their diet." --EveryDiet.org "An earthy, health enthusiast, informational collection of eating your veggies, greens, and fruits through smoothies." --Reading For Sanity "I discovered the Boutenkos with their amazing book, Green Smoothie Revolution. It literally changed the way I cooked (or didn't), ate and fed my family." --Eco Diva "I picked up Green Smoothie Revolution to better understand why we need to rotate our greens, but while reading I came to see that it's a great place for healthy eating newbies to start. It not only helps you understand why greens are so miraculous, but then gives you 200 examples how to give it a shot. ... Green Smoothie Revolution is great for veteran health freaks too. It's always nice to be reminded why you care about good nutrition, healthy habits and the great things you for your body every day." Victoria Boutenko teaches classes on raw food all over the world, and is an adjunct professor at Southern Oregon University. Her (and her family's) teachings have inspired raw food communities everywhere. A regular contributor to such publications as Get Fresh, Just Eat an Apple, Alive, and Natuurstemmingen, she lives in Ashland, OR.